Republished July 10, 2018, 10:00 a.m. to correct the units for China's imports of crude oil and propane. 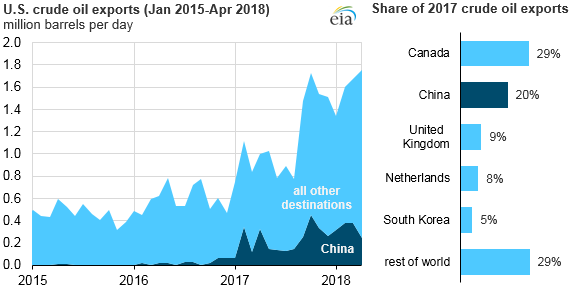 In 2017, more U.S. crude oil was sent to China than any other destination except Canada. China received more U.S. crude oil in 2017 than the third- and fourth-largest importers, the United Kingdom and Netherlands, combined. China has been the world's largest net importer of total petroleum and other liquid fuels since 2013 and surpassed the United States as the world's largest gross crude oil importer in 2017. 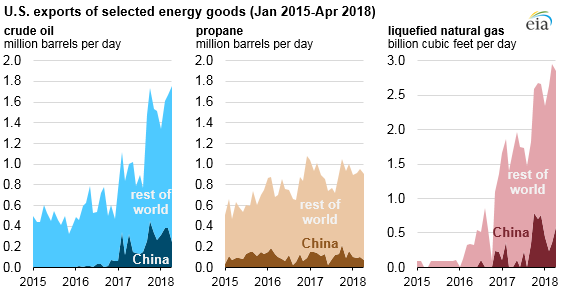 Based on data through April, China's imports of U.S. crude oil have continued to increase, averaging 330 thousand barrels per day (b/d) in 2018. 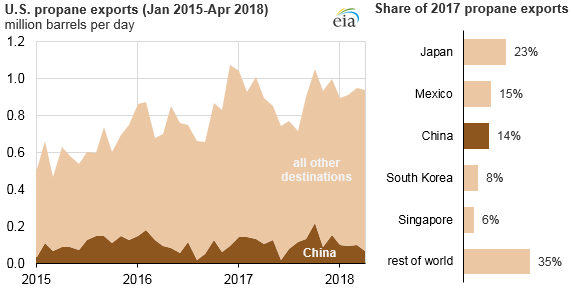 In February 2018, China received more U.S. crude oil than any other destination. Nearly all of these crude oil exports were sent from the U.S. Gulf Coast region. 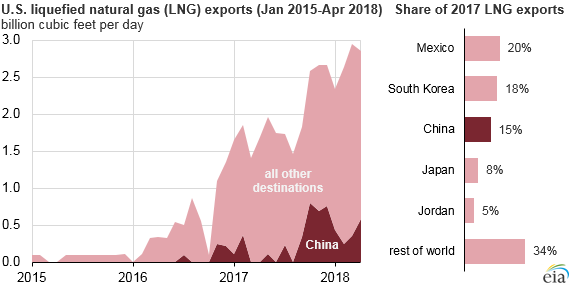 Based on data through April 2018, China's imports of U.S. LNG have averaged 0.4 billion cubic feet per day, behind only South Korea and Mexico. The next-largest importer of U.S. LNG, India, has received less than half as much U.S. LNG as China so far in 2018. China also receives other petroleum product exports from the United States, such as petroleum coke and normal butane. Although China has large domestic supplies of coal, China also imports some coal from the United States. In 2017, China received 3.2 million short tons of U.S. coal, or 3% of total U.S. coal exports, making it the tenth-largest destination for U.S. coal exports. About 90% of China's 2017 imports of U.S. coal was metallurgical coal used in the production of steel.